If you're looking to take your first foray into the world of football betting, Over / Under 2,5 Goals Betting is a great introduction. 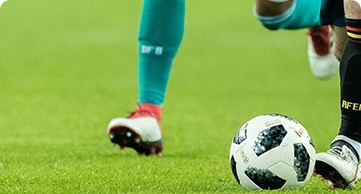 Players can simply bet on the amount of goals that will be scored during a game, without having to predict a winning team in order to pocket a win. Odds and returns are relatively small, but the committed player can amount impressive accumulated winnings from this method of betting. What Does Over/Under 2.5 Goals Betting Mean? Over / Under 2,5 Goals Betting can be one of the easiest ways for those new to Asian Handicap betting to hedge their bets, reduce risk and wager on more secure outcomes. One of the most popular ways to bet on football match outcomes, Over/Under betting is relatively straightforward on the surface, with bettors wagering on whether a football game will see 3 or more goals scored, or 2 or fewer goals. An under 2.5 Goals bet means that less than 3 goals can be scored during any match, but the outcome can take on many forms, be it a draw at nil, a one goal tie, or a 1-0 or 2-0 victory to either team. Over 2.5 Goals require a minimum of 3 goals to be scored during play time, and require no particular outcome to be successful. It’s only possible to bet on goals accrued during regular full-time. Any goals earned during extra time are not counted. This method of betting is so popular because of its transparent nature, and the relatively even chance of winning and losing. Team history, player performance and match statistics can all help make a more informed wager, and odds and return rates will sometimes deviate slightly, depending on the bookmaker placing the odds. The reason for the decimal point, or half goal, is that this eliminates a chance of a tied outcome. You can only win or lose when you place an Over/Under bet. How Does the Over/Under 2.5 Goals Betting Work? It’s relatively simple to get started with Over/Under betting, even if it’s your first wager. Regardless of where you place your bet, let’s take William Hill, for example, you’ll find Over/Under 2.5 Goals bets not far from the even mark at any given time. An everyday betting scenario might look something like this: Team A are playing Team B, with Under 2,5 Goals odds at 1,83, and Over 2,5 Goals odds at 1,83. A bet of £100 on an Under 2,5 Goals bet would require that the game end in 0-0,1-1, 1-0 (to either team), or 2-0 (to either team) by the final whistle. No goals scored in extra time are counted. A successful bet here would see a return of £183, with a profit of £83. If three or more goals are scored, you’ll lose your wager. Because of the relatively simple odds and 50/50 chance of winning, Over/Under 2,5 Goals betting can be incredibly lucrative to players looking to commit league and championship long systems. When deciding on which way to bet on any match, players should also look at the two football teams in question, their performance in each of their previous three games, and top up the goal tallies of either both teams, before getting an insight into the average amount of goals scored by either side. This will give a truer idea of what the actual outcome of the game might be, although additional stats and handicaps should also be taken into account. Although the main 2,5 Goals model is the most common in football statistical betting, there are other ways of wagering on specific odds and outcomes. Over / Under 0,5 Goals betting lets you wager an outcome where no goals are scored, while Over / Under 3,5 Goals betting lets you wager on a minimum of 4 goals being scored before the final whistle. Whilst Over/Under 2,5 betting is based on average match outcomes and typical numbers of goals scored, betting on more extreme goal tallies can be much more lucrative for the individual, with more attractive rates of return on what is still a relatively simple outlay. Although Over / Under 2,5 Goal bets can be a more secure way of winning, there’s still plenty of ways to increase your chance of returns. Studying the statistics and playing trends will help you make a more informed decision. Although the outcome of Over / Under betting is relatively even, there’s a slight increase in games finishing with over 2,5 goals in Premier League games. Top performing teams playing against each other also increases the chance of an Over 2,5 goal outcome (sometimes as much as 58%). Using match and team statistic websites to drawn up an instant history of Over and Under 2,5 performances will help you get a clear snapshot of which bets are worth your time, and which teams and matches are best avoided. Most online bookmakers and betting exchanges have designated pages and sections for Over/Under 2,5 goals betting.